Anti-wrinkle injections help relax certain facial muscles that cause wrinkles by blocking the nerve impulses that trigger wrinkle-causing muscle contractions. Therefore they can give the face a more refreshed and rejuvenated appearance. Anti-wrinkle injections are administered by Dr Safvat (not a nurse) in a few tiny injections with extremely fine needles. They are most frequently used on frown lines, crow’s feet (side of the eyes) and forehead lines to create a refreshed look. Anti-Wrinkle injections can also be used to produce a moderate brow lift. Anti-wrinkle injections cause minimal to no discomfort and are usually well tolerated but Ice packs and anaesthetic creams are available to minimise the discomfort from the procedure. It is important to remember that injectable treatments are medical procedures not simply beauty products, therefore Dr Safvat ensures new patients have the opportunity to have a facial analysis performed before appropriate treatments are recommended and discussed. Risks and benefits of treatment are also explained in your consultation. The effect becomes apparent after 3 to 4 days but full results may take up to 2 weeks. 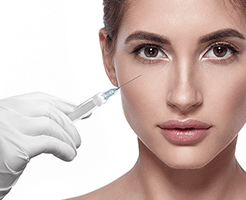 For the first couple of sessions Anti- wrinkle injections usually lasts around 3-4 months but after regular treatments it can last longer due to retraining of the muscles treated. Normal activities can be resumed immediately after treatment. However, strenuous exercise should be avoided for the rest of the day, after treatment. Overall the product has a very safe and proven track record. There are very few side effects and if they do occur they are usually minor and related to the injection site. There may be some slight local redness and swelling at the injection site but this usually settles very quickly. As with any injection occasionally a small bruise may occur and if it does it will heal within a few days and can be covered with makeup if necessary. Wrinkle injections are a safe and effective non -surgical method of facial rejuvenation when administered by the right practitioner. Plastic Surgeons are recommended for administering Anti-wrinkle injections because of their detailed and comprehensive knowledge of facial muscles and nerves.